Well the family descended on mass today, some of whome I haven’t seen for ever… Including aunty Barbara who is guaranteed to make me laugh, she’s great for advice too.. I think I’ve mentioned her in blog before. Also her husband uncle Paul who a 6foot something bearded Welsh man who is Dr doolittle when it comes to animals. Their son who’s not the most chatty unlike his mum lol. And my Nannan, D’s great Nannan. I haven’t seen her in years as she lives in deepest darkest Yorkshire which might as well be the moon when u have a buggerd back…. It was amazing to see them… Especially Nannan and Barbara as they are a fab double act.. I mean you could just watch them all day. Barbara has the most infectious laugh… Possibly the loudest but we love her for that I sware she could make you laugh at a funeral. We spoke alot about the practicalities and appointments and not including radio i currently have 9 appointments on my calender 1 at peterborough the rest at addenbrooks (a name i am starting to loath)… but we do have some very good news we have a vehicle and a driver for my radiotherapy appointments which is a huge weight of our shoulders i mean we still have a bazillion more – they clearly cant get enough of me and my charm and wit !!! -the car this was organised by the padre who i must say is the least padre looking padre i have ever seen but it seems to be a military thing see..
Padre – oh noooooooooooo i totally forgot Im in Dublim Im leaving now !! So we get there and he run thru it at a comedy speed gary gets the giggles we listen to nothing and diuscuss the 24hour bowlathon going on down the road – this convo included the padre who was going for a drink in a bit lol. One thing we did discuss was music – i walkled down the isle to angels … and he was to stop the cd when i arrived – fine nice and easy. So the morning went well my hair actually looked ok which is a triumph in its self – my dress was lovely and my car turned up. Soo off went to 3 minute drive to the church but a car was good for pics lol walked down the isle by my father who walked like he was marching me to my death… it was so bloody fast (my dad is 6 foot tall and his height is in his legs and his stride is huge) anyways he “jokingly say here have her ” he thinks hes a bloody comic genius at times – dont get me wrong theres the occasional one but u know. blares out of the cd player – well that was we are all in fits and the padre is panicing – if i am honest it was perfect as we were all laughing and having a good time by then – it was pretty smooth running after that other than the driver ripping his trousers comedy styleee. I have no ide how i got to talking about my wedding but hey now you know … oh yeah padre’s hers a link to the unicycling padre – i kid you not he used to get to work on a unicycle !! I am amazed how many people are reading my ramblings coz thats what they are its all the crap that wizzing round my crazy little head put down on paper wel on page .. you know what i mean .. It genuinly helps me – i remember funny stuff and the good bits and get to look through old photos which can never be a bad thing .. Previous PostA suprisingly productive day !!! 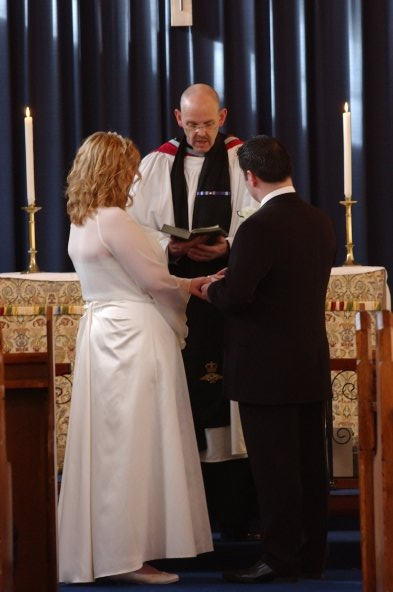 I was married by a RAF Padre, he was part Greek, couldn’t pronounce his surname, but he was great. So yo didnt take his name on then?? The Padre was park greek, we just called him Padre Nick, my husband has a really easy to pronounce name unless you happen to be part Greek or a salesman based in some part of India.